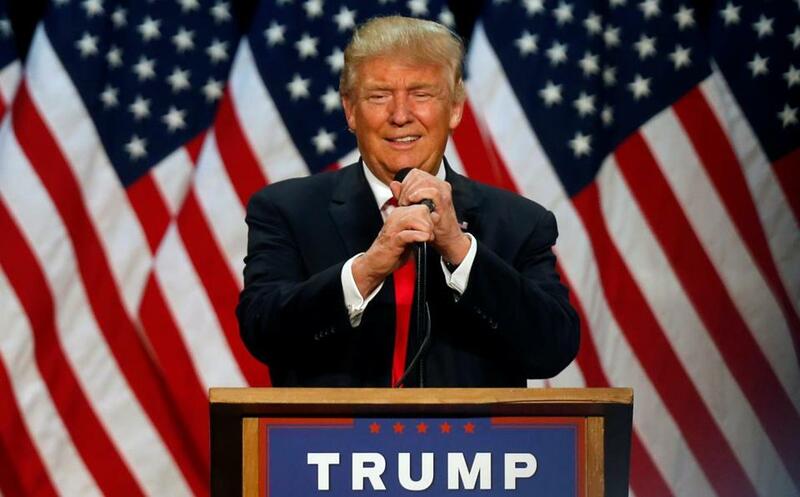 Republican presidential candidate Donald Trump said he will not release his tax returns before Election Day. WASHINGTON — Donald Trump, potentially upending four decades of political tradition and backtracking on his own prior promises, said in an interview published Wednesday that he might not release his tax returns before Election Day. The New York billionaire and presumptive GOP nominee said in an interview with the Associated Press that his finances are the subject of an ongoing Internal Revenue Service audit and he won’t release his returns until the inquiry is finished. He said he would not allow his attorneys to release the tax returns even if the audit is not finished by November. “There’s nothing to learn from them,” he told the AP, adding that he didn’t think voters are all that interested in his taxes. Trump’s refusal to agree to release the documents prompted an immediate backlash from both Democrats and Republicans, including a harsh condemnation from 2012 Republican presidential nominee Mitt Romney. “It is disqualifying for a modern-day presidential nominee to refuse to release tax returns to the voters, especially one who has not been subject to public scrutiny in either military or public service,” Romney said in a statement. The comments again injected Romney into the presidential campaign, and in an unlikely role given Romney’s 2012 campaign stumbled when he was reluctant to release his own tax returns. The former Massachusetts governor, who in March ridiculed Trump as a “phony” and a “fraud,” has said he will vote for neither Trump nor likely Democratic nominee Hillary Clinton. Romney dismissed Trump’s argument that an ongoing audit would prevent the candidate from releasing at least some years worth of tax returns. After mounting criticism Wednesday — and a back-and-forth with Senator Elizabeth Warren on Twitter in which she called him “dangerous” and “reckless” and he called her “goofy” and “Our Native American Senator” — Trump seemed to backtrack on when his taxes could be released. “In interview I told @AP that my taxes are under routine audit and I would release my tax returns when audit is complete, not after election!” he wrote on Twitter late Wednesday afternoon. Trump protested Wednesday night that he never said he wouldn’t release his returns. “I said that I’m being audited,” he said in an interview on Fox News. “Hopefully, before the election I’ll release. And I’d like to release,” Trump said, adding that it would be “meaningless” to put out returns for earlier years outside the inquiry because they would be so out-of-date. Earlier in the day, Clinton jumped on the latest tax twist while campaigning in New Jersey. She said she has released 33 years of tax returns, eight of which are currently posted on her campaign website. Modern presidential candidateshave grown accustomed to releasing documentation so voters can make informed decisions about their qualifications. The candidates release letters from their physicians that provide some details about their health, and usually release financial information as well. Trump himself was a major force pushing President Obama to release his birth certificate — and he also criticized Romney for not releasing his taxes earlier in 2012. During a GOP debate in February, Trump declined to agree to release his tax return when his rivals pressed him, and also said at the time that he was being audited. In a Februaryinterview on CBS’s “Face the Nation,” Trump was asked specifically when he would release his taxes. A typical presidential candidate, in a typical election cycle, would bend amid a storm of criticism if he or she suggested not releasing returns. But Trump has shown he’s anything but typical, leaving it an open question as to whether criticism from Romney or others will change the candidate’s calculation. Indeed, he’s brushed aside earlier calls from Romney to release returns. Trump has boasted that he is worth well over $10 billion, even though Forbes has estimated he is worth $4.5 billion. His tax returns would not necessarily provide clues about his net worth, but they would give better estimates about how much he makes, and from what sources. The tax returns would also indicate how much of his wealth he donates to charity, how much he pays in taxes, and how he structures some of his assets and investments. Still, Trump’s many critics will undoubtedly seek to turn up the heat — or at least make as much political hay out of the situation as possible. And longtime observers of presidential politics worry about the precedent set by a leading candidate refusing to comply with a decades-old practice in transparency. “It’s 40 years of tradition, which I think at this point carries a lot of moral and ethical weight,” said Joseph Thorndike, director of the Tax History Project at Tax Analysts, a Virginia publisher of tax news and commentary. “A candidate should be willing to say, ‘Here, take a look at the way I conduct my personal financial life,’ ” he said. Victoria McGrane can be reached at victoria.mcgrane-@globe.com. Follow her on Twitter @vgmac.